Fifty years ago, Jimi Hendrix released his third and final album, his magnum opus, Electric Ladyland. Led by the hits, “Crosstown Traffic”, “Voodoo Child (Slight Return)” and his blazing rendition of Bob Dylan’s “All Along The Watchtower”; the expansive double album hit #1 on the Billboard charts and showcased all sides of Hendrix, from his blues-rock roots, to his more experimental and psychedelic side. In celebration, Experience Hendrix, L.L.C. 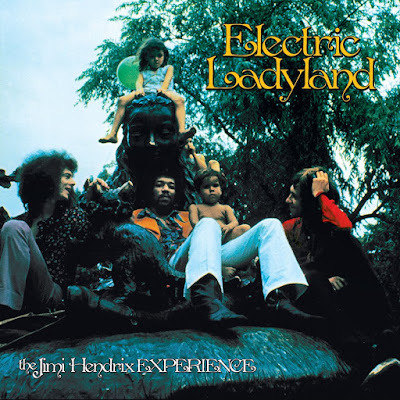 along with Sony Music’s Legacy Recordings recently released an expanded deluxe 50th anniversary edition of Electric Ladyland. Available as a 3CD/1 Blu-ray set or 6LP/1 Blu-ray set, the original album has been remastered by Bernie Grundman from the original analog tapes and has never sounded better. Likewise, the Blu-ray includes a new 5.1 stereo surround mix from original engineer, Eddie Kramer. The deluxe edition is highlighted by a full disc of unreleased demos and alternate takes taken from the original sessions that show how the songs evolved. Two of the standouts are demos of songs titled, “Angel” and “My Friend” which never made it onto the album. Also included is the previously unreleased live album, Jimi Hendrix Experience: Live At the Hollywood Bowl 9/14/68, performed and recorded just a few weeks before Electric Ladyland was released. In addition to Ladyland tracks, the track list also includes energetic performances of “Fire”, “Hey Joe”, the “Star Spangled Banner” and a cover of Cream’s “Sunshine Of Your Love”. The package is housed in a beautiful 12x12 hardcover book loaded with tons of pictures and essays from Rolling Stone’s David Fricke and producer John McDermott, as well as reproductions of Jimi’s handwritten notes about the album and lyrics. Also, the original photo for the album cover is used, as Jimi had always intended. Co0mpleting the package is the Blu-ray, which in addition to the album in 5.1, includes the documentary film, At Last… The Beginning: The Making of Electric Ladyland which features an oral history of the making of the album.